This entry was posted in climate change, Data, Methodology, Uncertainty and tagged Met Office, sea level rise by Ruth Dixon. Bookmark the permalink. Ruth Dixon spots a curiously unreferenced asserrion in the MET-O’s new report backing Dame Slingo’s reframing of the weather as climate. This really isn’t relevant to the Met Office prediction. Someone has shifted a decimal point. That prediction is off by a factor of ten. 1.6 cm will be close to correct. That looks too low to me. 3mm/year (likely to increase by 2030), gives 5 cm or so. The closest thing in the AR5 IPCC report is figure 13.23. For Brest, this shows a projected rise of about 4mm/yr, which would correspond to about a 6cm rise by 2030. I’m still trying to parse this phrase ‘a further 11-16cm of sea level rise is likely by 2030‘. 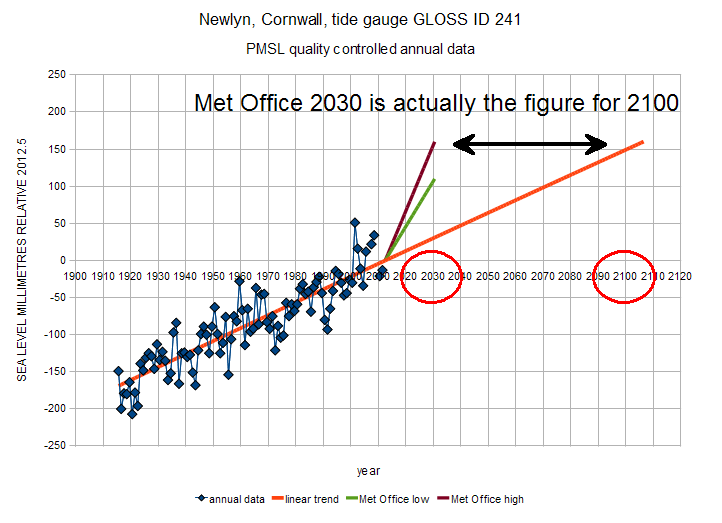 Is the Met Office using IPCC-style ‘calibrated’ uncertainty, so likely means 66 – 100% certain? And is the 11-16 cm range a 95% confidence interval, or something else? Are they 2/3 certain that they are 95% certain of this range? We just need a ‘medium confidence‘ in there to make our joy complete. Based on expert judgement it is likely that the Met Office has made an error of some kind in assembling this document, but I have low confidence in any of my guesses as to precisely what the error might be. Sorry I didn’t cite you properly last night. Ah, okay, was a new plot between the lines, you have images disabled so email me for the link. Thanks – I’ve added your plot as an update above – hope that’s ok – I don’t know how to put images in comments. No worries about the cite! Also, these numbers are for relative sea level rise, including both climate change and vertical land movement. So, Athelstan on Bishop Hill was right that this was part of the reason for the numbers seeming large compared to the AR5 global projections, and you were also right that there was more to it than that. Sea level along the English Channel has already risen during the 20th century due to ocean warming and melting of glaciers. With the warming we are already committed to over the next few decades, a further overall 11-16cm of sea level rise is likely by 2030, relative to 1990, of which at least two-thirds will be due to the effects of climate change. Sea level along the English Channel has already risen by about 12cm during the 20th century; this is over and above the increases associated with sinking of the southern part of the UK due to isostatic adjustment from the last Ice Age. With the warming we are already committed to over the next few decades, a further overall 11-16cm of sea level rise is likely by 2030, relative to 1990, of which at least two-thirds will be due to the effects of climate change. We are very confident that sea level will continue to rise over coming decades as the planet continues to warm, and these numbers represent our current best estimate for the UK. Clearly sea level rise from whatever source has to be factored into discussions about resilience to coastal and river inundations. References are now included in that paragraph. Thanks very much for spotting this! Richard, those figures don’t jibe with other sources. For example, Table 2 shows the rise at London from 1990-2010 as 6.2 mm (medium), or 3.1 mm/yr. According to NOAA, the long-term rate of sea level rise at Sheerness is 1.66 mm/yr. It doesn’t seem to be following a straight line of late, so it’s a bit hard to guess the recent trend, but visually it doesn’t seem far off the long-term rate. Presumably the land is rising around there, as that’s less than the global average. On the other side of the Channel, Dunkirk shows a rate of 1.71 mm/yr. Typo in the above: Table 2 shows the 1990-2010 rise as 6.2 *cm*, not mm. The derived rate is correct. 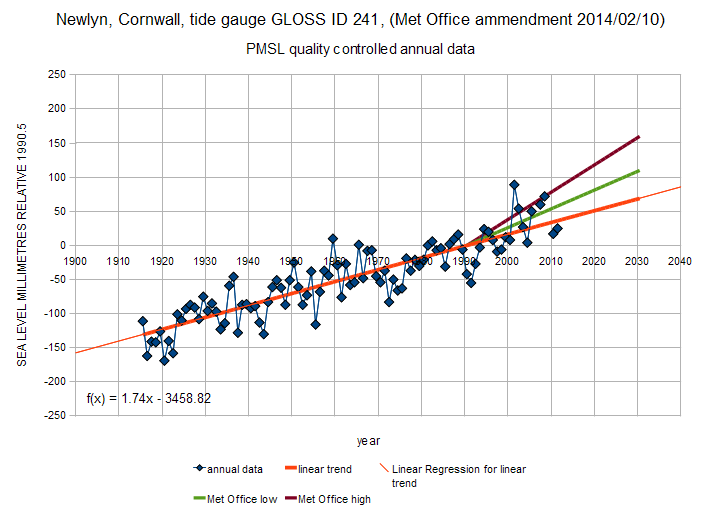 Regression on Dover levels from 1961-present gives 2.21 mm/yr. Lol. So MET-O still leaves the astute reader to do the calcs, while giving the casual readerthe impression of rapid sea level rise. This should be the end of the whole Global Warming debate. Okay, I’ve reworked the plot, still pleased to see me. If there is a blank here, a plot didn’t take. I was going to do a post on my own blog on things to do with the Newlyn data, of low interest to most readers. Might put up a new post at the Talkshop. It is good of you to comment here and to bring news of this update, but are you really happy with this mealy mouthed and misleading change? There are several things badly wrong with this response. The first thing is the complete failure to acknowledge the original error or the fact that it has been corrected. I see that the pdf has been changed, but there is no note in the pdf to this effect, and there is no note on the html page. Similarly the choice of words in the revised text is deeply obfuscatory, and seems almost designed to confuse: “a further overall 11-16cm of sea level rise is likely by 2030, relative to 1990” is self contradictory drivel. Overall this sorry affair simply acts to feed the impression that the Met Office is a bunch of amateurs who are more concerned about the political impact of their reports than their actual content. This impression may, perhaps, be unfair, but it is hardly irrational, and choosing to feed it is extraordinarily unwise. As Jonathan says, the revised statement “a further … relative to 1990” is complete nonsense, and makes the Met Office look even more foolish. Over the next 16 years, I expect to age a further 40 years, relative to 1990 levels. Flooding will become worse due to the rise in sea level, which has already risen by about 12cm in the past 100 years, with a further 11-16cm rise projected by 2030. Ruth: Wow! I’ve not see the Times, but it seems to be this Open Letter from the CCC which doesn’t actually specify the start date but allows that interpretation. […] was not intended for a “wide audience” – and it’s way out of the communication ballpark if Dame Julia and her ten co-authors were aiming for “near-universal understanding”. I wanted to see if any of these “updaters” – whose ideas of clarity, provenance, traceability and accountability seem to parallel those of the IPCC, i.e. (perhaps for all their intents and purposes) virtually non-existent – could spot a citation error all by themselves. Yet in version 1, this same very same text was cited and referenced as Footnote 12. And if they can’t be trusted on the small stuff, why should anyone trust ’em on the big stuff, eh?! The numbers above include isostatic adjustment, and were worked out for me by a colleague today – they are close to those for London in Table 2 of the UKCP09 sea level report cited in the Met Office report. NB These don’t represent the full uncertainty range – see Figure 1.3 of the UKCP09 sea level report for the 5th & 95th percentiles of the projections. However, I’ve quoted the 50th percentiles because those were the post-1990 numbers given in the Met Office report. Thanks Richard, that makes the source of the numbers very clear. An SLR of 5-7 cm between now and 2030 looks very like my and Paul M’s estimates (above) of 5 or 6 cm based on IPCC projections, being about 3 to 4 mm per year. I’m glad the Met Office and the IPCC agree. The numbers I gave above are for the sea area within -4.5W – 2.0E, 49.0N-51.0N, so this is basically the English Channel as a whole. I realise that I’ve left a comment hanging above. So to round this off, here are my thoughts on the matter. It’s not that I think the original mistake was deliberate – far from it. Clearly it was an honest mistake, which was rapidly corrected and a new version of the report posted promptly, which is to the credit of the Met Office (though I wish the Met Office would remove the old version or label it as such on their website, as it is still causing confusion). I did feel ‘deeply disturbed’ when I wrote that comment but have subsided to ‘very concerned’. And it’s not because I want to cast doubt on ‘the science’ but because I very much want to believe what I’m told by the official scientific bodies of this country. I do not want to wonder whether I can trust the numbers that the Met Office puts out (‘These numbers represent our current best estimate for the UK.’) and are quoted by others around the world. The paragraphs on sea level were by no means central to the report, which was on the recent (2014) floods and storms – there was clearly no intention to move sea level rise to centre stage. When I asked my question I expected either to be quickly informed that I had misunderstood something or pointed to a reference that made everything clear, or maybe to find that a simple typo or misstatement explained the matter. However the new version of the report appears to show that there was a genuine misunderstanding on the part of the authors of the paragraphs on sea level rise. I’m somewhat concerned about the original mistake, but mistakes of course happen. I’m much more concerned that it was not picked up by any of the distinguished authors of the report who presumably approved it – it was in the summary on page 2, as well as on page 21, nor by the many who uncritically repeated it. Sea level along the English Channel has already risen by about 12cm in the last 100 years. With the warming we are already committed to over the next few decades, a further 11-16cm of sea level rise is likely by 2030. This equates to 23-27cm (9-10½ inches) of total sea level rise since 1900. This paragraph clearly compares 12 cm in 100 years with a further 11-16 cm … over what period? I read it as from 2014 to 2030 – and I’m far from alone in that reading – though the following sentence suggests some ambiguity about the dates. Sea level rise of 12 cm in 100 years versus 11-16 cm in 16 years implies a 6-to-8-fold acceleration by 2030 – which has so far not happened. Did none of the authors have a visceral feel for what those numbers implied? The paragraph leapt out at me as if someone had reported a 20 foot kitten. So – if it did not mean that – what did the paragraph mean? As the new version makes clear, the 12 cm in 100 years along the English Channel did not include isostatic adjustment (sinking of southern Britain as the north has risen since the last Ice Age) and so considerably understated the overall sea level rise around southern England over the 20th century. However, the 11-16 cm (which turns out to be the UK Climate Impacts Programme’s projection for London, 1990 to 2030), did include this adjustment. You simply can’t add together two different metrics, for different places, with overlapping timescales, and say that the result is meaningful. But this is what the report seemed to do (although the arithmetic is not exact) to give the overall sea level rise for the English Channel. This is why it seems to me that the numbers were not completely understood by the report’s authors. Anyway, the revised report did away with the addition of the two numbers, and also made clear that ‘the last 100 years’ meant ‘the 20th century’. But wouldn’t it have been more useful to compare overall UK sea level rise (including isostatic adjustment) over the last century (i.e. what the tide gauges measure) with the same metric for this century? Compare apples with apples as it were, using the actual policy-relevant metric? Instead, we see the minimum change to the report that ensures it is not actually wrong, but which still compares two quite different metrics with overlapping time periods, still giving the impression of accelerating sea level rise, when comparable metrics are available. We are very confident that sea level will continue to rise over coming decades as the planet continues to warm. Clearly sea level rise from whatever source has to be factored into discussions about resilience to coastal and river inundations. Finally, while I do think that the Met Office moved quickly to produce a new version of the report, I cannot understand their attitude to version control (see also Hilary Ostrov’s comment above). Both versions of the report remain on the Met Office website, and a Google search for links to the old report produces far more hits than for the new one. It is still being shared widely. There is no indication on the pdf of either version that it has been revised, so the casual reader has absolutely no idea which version they are reading, or even that there are two versions. The Met Office should remove the old version from its website, and redirect readers to the new version. Why does any of this matter? Sea level rise isn’t the focus of the report, after all. But these numbers are probably the most widely quoted numbers in the report – they provide an easily-understood graphic impression of apparently rapidly accelerating sea level rise: an impression which is incorrect for the period under discussion. If the Met Office wants to be trusted on big issues, they need to demonstrate trustworthiness on issues such as this. The Met Office said rising sea levels would increase the risk of flooding. It added that the level had risen along the English Channel by 12cm in the past 100 years and “with the warming we are already committed to over the next few decades, a further 11-16cm of sea level rise is likely by 2030”. Dame Julia said: “That might not sound a lot, but when you are looking at storm surges, when you are looking at moving water from the Somerset Levels out to sea, it does matter”. Considering the Met Office’s past practice of “passive promotion” of that which they know to be untrue, I am not in the least surprised. See, for example, the long lingering and misleading Marcott headline – evidence of which they subsequently “disappeared”, as they have done with their “update” version of the still extant erroneous and misleading text in this latest hasty pudding. Thanks for your comment, Hilary, and I agree with many of your points. But I’d like to defend Richard on this – he wasn’t an author of the Met Office report, but he did draw my question to the attention of the authors and the report was changed very quickly as a result. Not in the way that we might have liked, perhaps, but Richard was not responsible for that, nor has he tried to defend it. He was also on leave this week as it’s half-term! Your research is to be commended, along with Richard Betts for bringing the matter to the attention of the authors. We have gone from an apparent 700% acceleration in the rate of sea level rise, to absolutely zero compared with the global average of 3.2mm +/- 0.4 per annum for the last 20 years. Over 40 years that is 11.2mm to 14.4mm compared with the Met Offices estimate of 11-16cm. What they have done with some of the best computing power is equivalent to a forecast I could do on a calculator in two minutes. That is to assume that the local tide gauges will catch up with the satellite data. It makes sense if you assume that the satellites are accurate. Thank you! Unlike Canute I’ve managed to prevent the rate of SLR accelerating (not!). Though it seems the Met Office didn’t even do their own calculations, but – as far as I can see – just pulled two quite different metrics off the internet (Wahl et al. 2013 for the 20th century (not including glacial rebound) and UKCP09 for 1990 to 2030 (including glacial rebound)). Then they apparently misunderstood these numbers so badly that they thought they could add them together – and have now had to back-track a bit, reaching, as you say, pretty much the expected number. Below are pertinent excerpts for TGP. Most interest then was about the rate of sea level rise as the Earth warmed following the “Little Ice Age”. That cool period, from about 1500 to 1700 AD, halted wine- making in England and taro cropping in New Zealand. Our Group determined the rate of sea level rise in many different World regions, from widely-available readings of tide gauges (less variable than those of thermometers). The average for us all was 125 mm/century (“125” here). Hence it would take 8 centuries for sea level to rise 1m – no serious threat to us. That rate of rise was equivalent to 3,500 mm/century, 28 times faster than our 125. Hence we stupidly ignored it, thinking no- one could possibly believe it. But the World did believe, and the Global Warming mirage was born. Had 3,500 been true, sea level should have risen by almost 1 m by today – it hasn’t, not even closely. So did the Met Office actually check? Or is this the oxymoron local global?